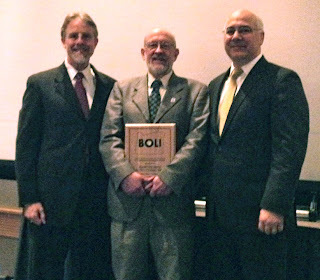 Hawthorne Auto co-owners Jim Houser and Liz Dally were nominated for their efforts to foster a more livable community. Houser's work to increase small business employees' access to healthcare and to provide career paths in mechanical fields for diverse youth, and Dally's support for Bradley­Angle House and leadership on workplace protections for victims of domestic violence, sexual assault and stalking-a civil right enforced by BOLI, coupled with their business commitment to the environment as a certified Eco-Logical Business, helped earn Hawthorne Auto this year's Civil Rights Champion award. For 14 years, SE Works has helped build positive connections between job seekers and employers. The extraordinary efforts of SE Works to assist job seekers, especially low-income, multi-barriered individuals, in seeking and applying for jobs have also translated to strong relationships with employer who will reach out to SE Works when they need reliable help. The range of services and programs offered by SE Works helped to set them apart as this year's Workforce Development Champion. 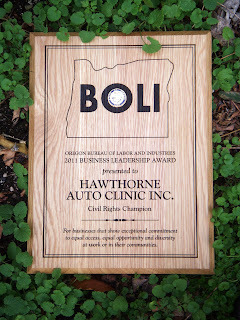 Avakian created the BOLI Business Leadership Awards in 2009 to recognize the good work that Oregon's employers do every day for the community, their workers, and the future of Oregon's economy. The mission of the Bureau of Labor and Industries is to protect employment rights, advance employment opportunities, and protect access to housing and public accommodations free from discrimination. We are honored but a little flabbergasted to be chosen for this award. I must confess that we have no hundred page corporate civil rights policy, no full time paid lobbyist for just causes, and no ambitious multifaceted retraining program for the disadvantaged. After all, we are a 13 person small business and have no direct effect outside our shop except by using whatever influence we have, as gadfly to our industry and advocate for the community. For the past 29 years a focus of our enterprise has been developing a workplace which functions for the benefit of our customers, our employees, and our neighborhood. Although occasionally we do show a profit, and fiscal stability is necessary, obsession with “the bottom line” for its own sake clearly causes real harm in our society. To our colleagues who whine “But I’m just a small business person, I can’t afford to…(fill in the blank here: offer health insurance, make accommodation for the worker who is also a caregiver, or hire an apprentice)” we make this challenge: Get creative, think about what you can do, because together, all of us small business people will make a difference.